First thing that appears to mind about Goa is its beaches. The two districts of the state have their own specialities. The beaches in South Goa are known to be silent, less crowded and serene. And the beaches of North Goa are said to be happening and bustling with crowds. There are many tourist places, churches and museums to be explored in South Goa. Margoa, the main city is around 35km from the state capital Panaji. Goa tourism surprises people with its never ending beauty and activities. 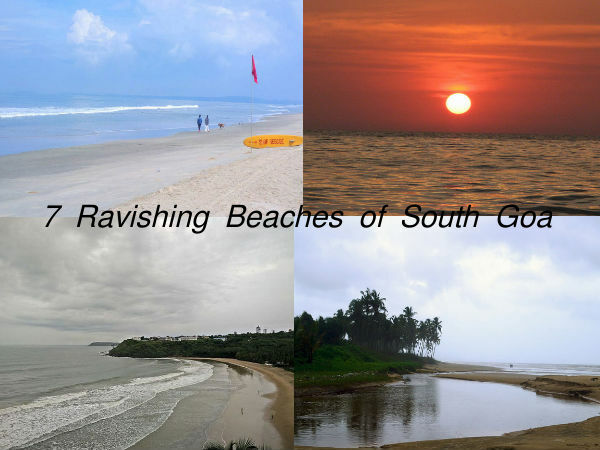 Let us tour around some of the most popular beaches in South Goa! Agonda Beach is around 40km from Margoa. It is one of the pristine and less crowded beaches in South Goa. It is also centre for activities like beach yoga, sunbathing, etc. Agonda Beach is also known for Olive Ridley turtles. Tourists can catch a some turtles walk their way through the shores. One can also visit Cabo de Rama fort which is 15km from the beach. Bogmalo beach is just around 4km from Dabolim Airport. The village of Bogmalo is the best way to enjoy authentic Goan cuisine and culture. Tourists can try activities like windsurfing and water skiing. Bogmalo beach is surrounded by resorts and hotels. One can stay in one of the beach facing resorts here. Palolem, the beach with white sand, is one of the famous beaches in South Goa. It is an ideal spot for picnics. One can go on Dolphin Cruise and also fishing, as it is the fishing beach. Palolem beach is surrounded by beach shacks and bars. Tourist can easily spend a whole day playing in the beach. Colva Beach has become popular in the recent years. The beauty of the place is very soothing and romantic. Colva Beach is located in Colva village and it is known for sunset views. The Church of Our Lady of Mercy is one of the major attractions near Colva Beach. A stretch of coconut grove surrounding the never ending beach is what allures you to this place. Benaulim Beach is just 2km from Colva Beach. It is not just a tourist place but also a mythological place in South Goa. It is believed that Lord Parshurama's arrow hit the ground in Benaulim and Goa was created.Benaulim beach is a favourite among locals and it is still an unexplored destinations for other visitors. The village of Majorda is famous for making European Breads. Majordans are considered as the best bakers in Goa. Majorda Beach is a lesser known beach, around 5km from Colva Beach. The tranquil atmosphere is just enchanting to experience here. Mobor Beach is one of the clean beaches in Goa. It is surrounded by resorts and luxury hotels. Mobor Beach is one of the unexplored beaches where you can enjoy the nature at its best. Get best deals on travel, receive travel tips and travel stories instantly Subscribe to Nativeplanet. Get best deals on travel, receive travel tips and travel stories instantly.